Why not join us for our Spring concert at the Bramhall URC on Saturday 11th May at 7:30 pm? 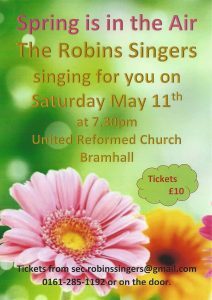 Tickets are available from members of the choir, the secretary (sec.robins.singers@gmail.com) or can be bought on the door on the night. Hold the date in your diary!